Samuel Wesley Stratton, 1861-1931, B.S. 1886, Illinois Industrial University at Urbana (later the University of Illinois), taught mathematics, physics, and electrical engineering at the University of Illinois, then physics at the University of Chicago, rising to the rank of professor in 1900. In 1899 he was asked to head the U.S. Coast and Geodetic Survey’s Office of Weights and Measures, where he developed the plan for the establishment of a bureau of standards. The law establishing the National Bureau of Standards passed in March 1901 and President McKinley appointed Stratton its first director; he remained there for twenty-one years. 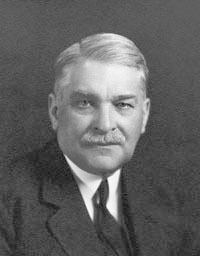 In January 1923 he became the eighth president of the Massachusetts Institute of Technology and served for seven years; he then became the first chairman of the MIT Corporation.